Overharvest spurred the Migratory Bird Treaty Act. Old journals are remarkably casual about waterfowl. A modern enthusiast interested in reports of ducks and geese back before the dragline and battery gun can thumb through a lot of dusty pages without finding any references to flocks "blackening the sky." There's little doubt pristine America was capable of producing incredible flocks. With twice as many wetlands and a breeding stronghold blanketed with native prairie, the continent's capacity to produce ducks in those times might have been 10 times what it is today. But if our forebears failed to report what they saw, I guess they are to be forgiven. Over the generations, they must have suffered from a bad case of wildlife overload: 3 to 5 billion passenger pigeons, 40 to 50 million buffalo, 10 million elk, a few million Carolina parakeets. It would take a lot of ducks and geese to make an impression. In fact, I'm impressed when waterfowl took center stage in reports that really should have focused on other things. When Lewis and Clark were building their winter quarters in North Dakota in 1804, Clark made this journal entry after a sudden cold snap on Nov. 9: "A great number of wild geese pass to the south, flew very high." The next day, he noted, "The geese continue to pass in gangs, as also brant to the south, some ducks also pass." The day after that, he watched "The large ducks pass to the south." The next fall, after passing through numberless herds of buffalo, elk, and antelope, the expedition ran into the fall migration along the Columbia. "Saw great numbers of waterfowl of different kinds," Clark wrote. "Immense quantity of geese, brants, ducks and some of the large and small kind of swan and sandhill cranes." On Nov. 5, 1805, he complained: "I [slept] but very little last night for the noise kept during the whole of the night by the swans, geese, white and grey brant, ducks on a small sand island close under the lard. They were immensely numerous, and their noise horrid." It's worth noting that elk and deer were hard to come by on the Columbia that fall, so waterfowl kept the Corps of Discovery alive until they reached the Pacific. In the midst of the abundance of the early 19th century, it was hard to believe all the men who ever shouldered a gun could erase an entire species, but in the mid-1840s, the disappearance of the great auk proved it was possible. In 1872, the Labrador duck followed the auk into the void, and the new breech-loading, repeating shotguns with chokes to provide denser patterns were putting dangerous pressure on the wood duck, a bird that had the poor judgment to spend its entire year in the dwindling forests of the eastern United States. The collapse, when it came, was impossible to ignore. 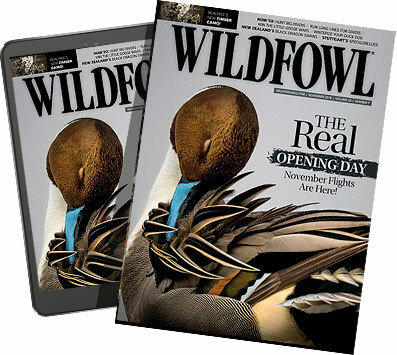 Like the bison, American waterfowl withered before the eyes of a generation of sport hunters. At first, they couldn't accept the possibility the flocks had disappeared. They assumed the birds had sought "other lines in their migrations." But as the 19th century ended, the trend in waterfowl populations was unmistakable. The problem was what to do about it. A number of states adopted laws designed to limit waterfowl harvest, and a few even found ways to enforce them. However, the system of protection failed to deal with migration. Birds saved from overharvest or spring shooting in one state soon moved into other states or countries where they had little or no protection. In his landmark book, American Duck Shooting, published in 1901, conservationist George Bird Grinnell spoke for many of his colleagues when he wrote: "To accomplish much good, such laws should exist in all the States&apos;¦ [but] it is difficult to suggest how a general and effective change in the shooting laws of all the States and Provinces of the continent can be brought about." Grinnell knew it was going to be hard to marshal political support for federal control of waterfowl hunting and even harder to get past possible constitutional objections to such laws. In 1903, George Shiras III, congressman from Ohio, took the first crack at gaining federal authority over waterfowl hunting, introducing "A Bill to Protect the Migratory Birds of the United States," which stated, "All wild geese and wild swans, brant, wild ducks, snipe, plover, woodcock, rail, wild pigeons, and all other migratory game birds which do not remain permanently the entire year within the borders of any State or Territory shall hereafter be deemed to be within the custody and protection of the Government of the United States." Shiras thought the concept of federal authority over interstate commerce could be stretched to cover the migration of wild birds, but other legislators weren't so sure. Even the dedicated conservationist Congressman John Lacey had his doubts. "The thought that interstate commerce has anything to do with the proposition," he wrote in 1905, "is too remote to form a basis for federal legislation." The Shiras bill died three months after it was introduced. However, many conservationists were convinced the concept was sound. Sportsmen's groups (the National Association of Audubon Societies and the American Ornithologist's Union) expressed support. In 1906, Forest and Stream magazine ran an article by Shiras defending the constitutionality of the approach. In 1908, John W. Weeks, congressman from Massachusetts, reintroduced the Shiras bill, only to see it defeated again. In 1911, Winchester Repeating Firearms Company organized an effort to protect game animals, raising funds for the purpose from the nation's arms and ammunition manufacturers. The funding led to the formation of a new conservation group, the American Game Protective and Propagation Association, which immediately began pressing for federal protection of migratory birds. Weeks reintroduced his bill, and George McLean, senator from Connecticut, introduced an identical bill in the Senate. The "Federal Migratory Bird Act" found its way to President William Howard Taft's desk as a rider on an agriculture appropriations bill. Taft promptly signed it into law. An immediate constitutional firestorm ensued. When he was congratulated on signing a bill to protect migratory birds, Taft said he would have vetoed the entire appropriations bill if he had known about the rider. Frank Mondell, long-time congressman from Wyoming, introduced a bill to repeal the act, and at least two federal district courts ruled the act unconstitutional. Washington insiders predicted the U.S. Supreme Court would soon strike down the act. tions to protect migratory birds. McLean and Root believed the content of a treaty could not be held to the same constitutional standards as a domestic law. McLean's bill passed July 7, 1913, and several officials with the departments of State and Agriculture immediately drafted language for a treaty with Canada. In spite of the outbreak of World War I in 1914, officials in Canada and the United States continued negotiations on the agreement. On Aug. 16, 1916, Canadian Prime Minister Robert Borden signed the treaty between the United States and Great Britain for the protection of migratory birds in the United States and Canada. Two days later, President Woodrow Wilson signed for the United States. Both countries submitted the treaty to their legislative bodies for approval. Opponents of the concept tried to defeat the bill that approved the treaty, but with the support from a coalition of farm groups, sportsmen and bird enthusiasts, it passed the House by a vote of 237 to 48. Wilson signed the treaty into law on July 3, 1918. Almost immediately, Frank McAllister, attorney general of Missouri, arranged to test the law. He notified federal game warden Ray Holland he would be shooting ducks in the spring in violation of federal regulations. Holland arrested the attorney general, and the resulting court battle rose all the way to the U.S. Supreme Court, where Justice Oliver Wendell Holmes wrote the opinion for the majority. "Here a national interest of very nearly the first magnitude is involved," Holmes wrote. "But for the treaty and the statute, there soon might be no birds for any powers to deal with. We see nothing in the Constitution that compels the government to sit by while a food supply is being cut off and the protectors of our forests and crops are destroyed." There have been other fights in the history of waterfowl conservation, before and since, but no other single effort has meant more to America's ducks and geese.